Bose SoundLink Revolve is a Bluetooth speaker with 360-degree sound | What Hi-Fi? 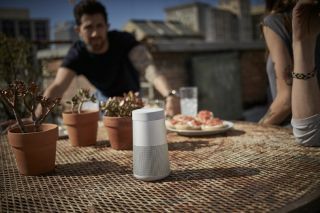 Bose's new Bluetooth speakers are perfect for the barbecue, with 360-degree sound, splash-proof design and a choice of two colours. Bose has announced two new Bluetooth speakers - the SoundLink Revolve and Revolve+. Both offer portability and 360-degree sound for your barbecue, when summer finally arrives. The big selling point is the 360-degree sound. Bose claims that because of the speaker arangement, both models don't have the sweet spots and frequency drop offs of other surround speakers, so the sound will be uniform for everyone at the barbecue. Inside are dual-opposing passive radiators, a powerful, ultra-efficient transducer that's positioned face-down, and a new patented acoustic deflector. There's also a pressure trap that eliminates distortion. Both models are built for the outdoors, too. They're both water-resistant, though not waterproof, and rugged enough to withstand bumps, scrapes and knocks. The only difference between them is size. The Revolve+ is slightly larger and more powerful, with 16 hours of battery life to the regular Revolve's 12. Both models come in either black or grey finishes and are available to pre-order now for shipment in mid-May. The Revolve costs £200, while the Revolve+ will set you back £280.